It's Book Business Friday. Wow! 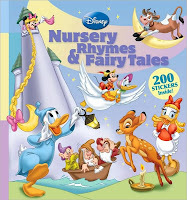 Like it or not, Disney sells about 250 million children's books a year. And now they are starting a new digital service to sell reading on a subscription website: "Disney Digital Books." The e-book business is evolving and we want to stay informed. Read all about their ambitious plunge into the unfolding electronic book world here. See the new website here.